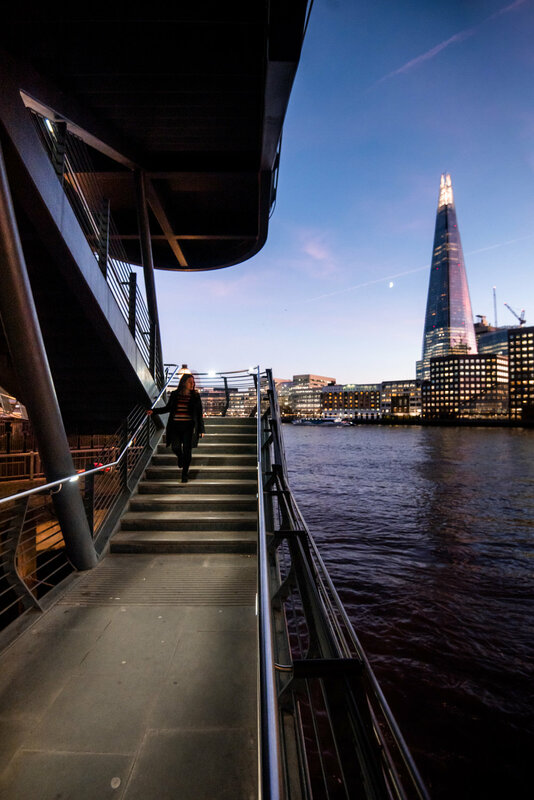 Housed in one of London’s newest and most iconic buildings, Shangri-La at the Shard delivers sleek and modern luxury accompanied by the perfect touch of London charm. I know to expect two things whenever we have the pleasure of visiting one of the 95 international Shangri-La Hotels: impeccable service and incredible location. Time after time we’ve been impressed with this global hotel’s ability to provide unique, quality experiences at every destination. Despite the fact that Shangri-La hotels are a chain, each one somehow still manages to deliver a hotel experience with unique, local flavor and charm. Our time in London was no exception! This hotel had all the trademarked class and luxury we’ve come to associate the brand with, with all the gem-like rarity that smaller boutique hotels strive for. We were in love! 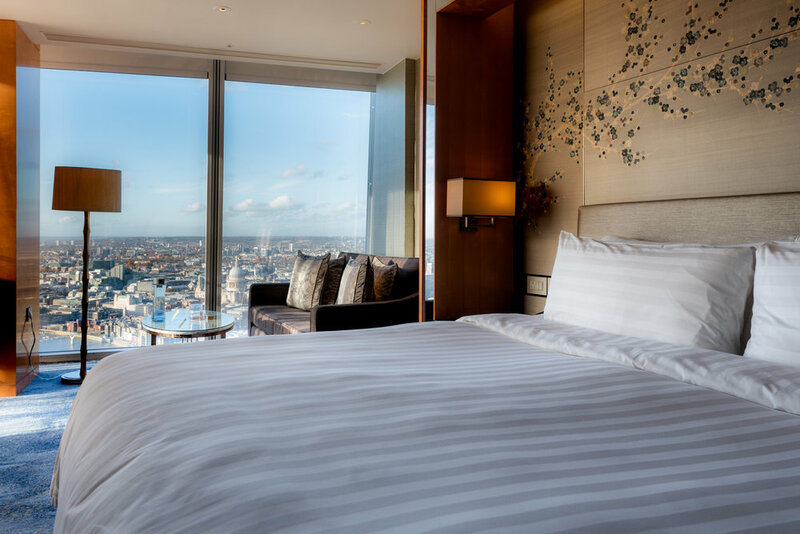 The Shangri-La in London is located in the Shard, one of city’s most iconic buildings. 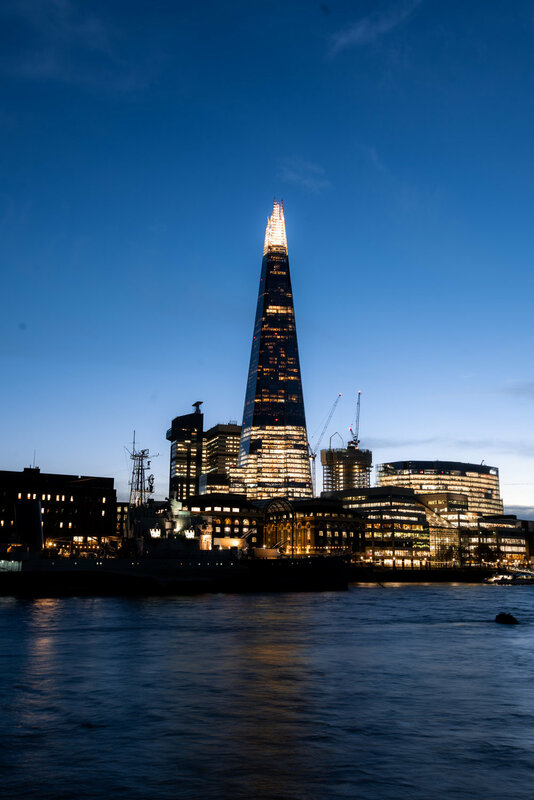 Placed in the heart of the city, the Shangri-La at the Shard is the capital’s highest hotel, which gives it a soaring, unbeatable view of the city’s skyline. Between the hotel’s scrumptious breakfast and glitzy, spacious rooms, this was the perfect place to end our trip to London for a few days. When we pulled up to the Shard, we came to a small, unassuming entrance before being ushered to the hotels 34th floor lobby. As soon as we stepped out of the elevator we were astounded by the view. What I mean to say is that in the Shangri-La’s lobby, the whole room is the view. Each wall is a towering, floor-to-ceiling window framing all of London’s bustle and charm; no matter where you look, you see the city. Of course, when the walls of the hotel lobby are quite literally London’s glittering skyline, any further, extravagant decorating efforts would be a crime! Instead, the Shangri-La’s reception desk and floor is elegantly swept in marble, which provides the perfect introduction to the elegant-yet-modern style we’ve come to love Shangri-La hotels for. As is customary, the hotel decor and ambiance strives to bring local flavor and influences into the mix. From striking wall art by local artists to inhouse music played by street performers, this hotel has all the trademarked luxuries we’ve come to expect from Shangri-La hotels, with all the unique taste and color of London. For the duration of our visit we stayed in one of the hotel’s ‘premier city view’ rooms. Upon entering, our breath was stolen yet again by towering, full-panel windows that framed a sweeping image of London’s soaring skyscrapers and winding streets. In short, the hotel really isn’t lying when it calls this layout the “premier city view” room. It means it in every sense of each word. In fact, even our bathroom boasted an incredible view! Views aside, for me the shining highlight was the bathroom. From luxury touches like dual vanities and a spacious walk-in shower, to a roomy spa bath and heated floors, I have to admit I was tempted to never leave. It even included something I now regard as a modern marvel: Japanese toilets which are heavenly and always warm. Because we were traveling with Axel who was 10 months old at the time, we loved that the hotel staff went out of their way to make him comfortable as well. He had his own crib and several amenities like extra diapers, powder, body wash and a high chair. Travelling with a baby can quickly make larger hotel rooms seem cramped, yet we found the spacious, multi-purpose layout of our room totally comfortable and large enough for the 3 of us. We also loved that on the night when we hired a nanny from Hopes and Dreams, the small living area gave the nanny a little extra room to play and interact with Axel. Nothing gets us out of bed in the morning like the promise of a mouthwatering meal! The hotel offers an impressive breakfast buffet spread at their restaurant; TING — with every standard item you could expect and then some. There are also several a la carte options like a full English breakfast and middle eastern variations if you’re looking to mix it up. As for us, we tended to make a bee-line for the granolas and smashed avocado on toast. The chef even prepared fresh avocado and porridge for Axel. During our stay, the food at Ting quickly made breakfast one of our family’s favorite activities. 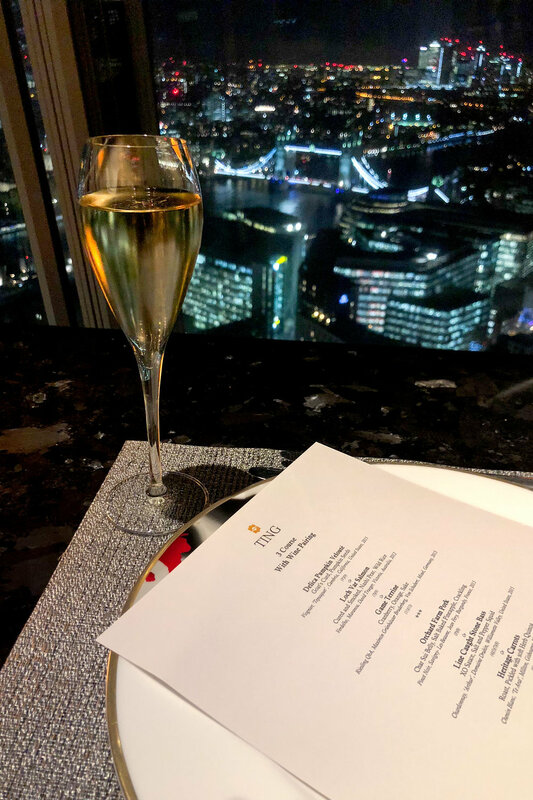 In the evening, as the sun sets over London, TING transforms into an elegant and dimly lit restaurant that showcases the floor-to-ceiling windows which give the Shangri-La at Shard its signature view. The menu changes seasonally and usually contains both local and Asian-inspired comfort foods which are impressively and artistically presented. On top of the fact that this is such a stylish restaurant which serves up a mouthwatering food, we were also thrilled to learn that the dishes ingredients are thoughtfully sourced and fresh. In a city with as many cocktail bars as London, you might be surprised to hear that we for one of our “kid-free nights” (thanks Hopes & Dreams!) we decided to stay in the hotel and have a cocktail — well 3 cocktails actually — at GONG, the hotel’s, Asian-themed cocktail lounge. However one look at the menu, and the views, had us conviced it was the right decision. 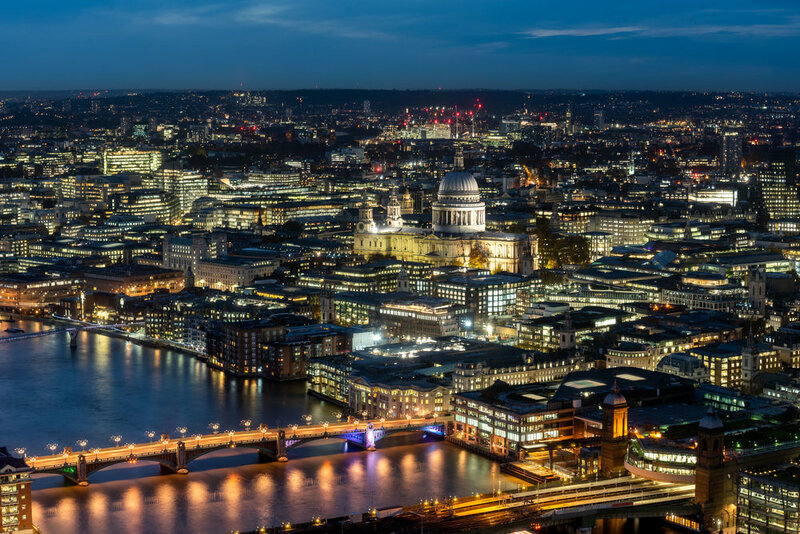 Located on the 52nd floor of the Shard, this swanky space is the highest hotel bar in Western Europe. While the view is breathtaking (especially in the dazzling golden light of a London sunset), the real highlight is GONG’s specialty cocktails. 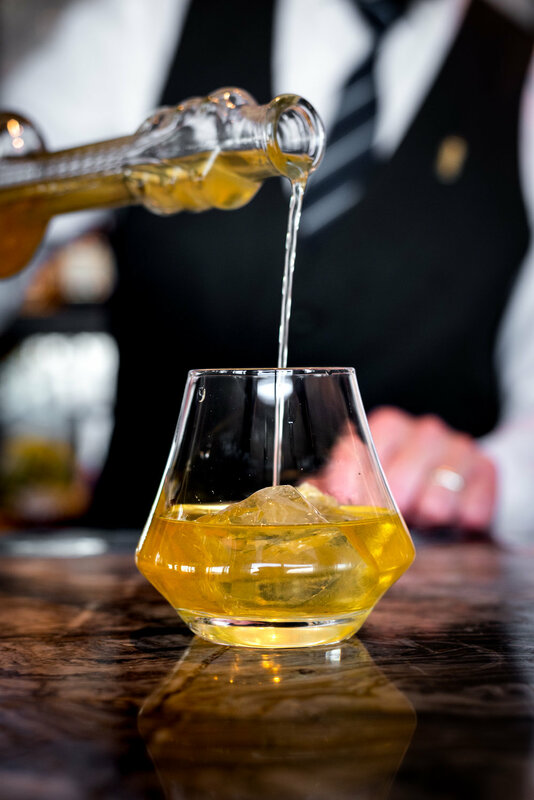 For a drink you’ll never forget, order their Director’s Cut or Fields of Gold, which is uniquely garnished with actual ants — yes, those ants. Just be sure to call ahead and make a reservation, as this place is extremely popular among locals and hotel guests alike. We can’t be sure that the treadmills facing the windows in this hotel’s fully-equipped, 24-hour fitness center have the world’s best workout view, but we’re pretty sure it’s possible. Regardless, the Shangri-La’s fully-equipped fitness center is a great bonus for guests wanting to burn off a few calories from all those feasts at TING. 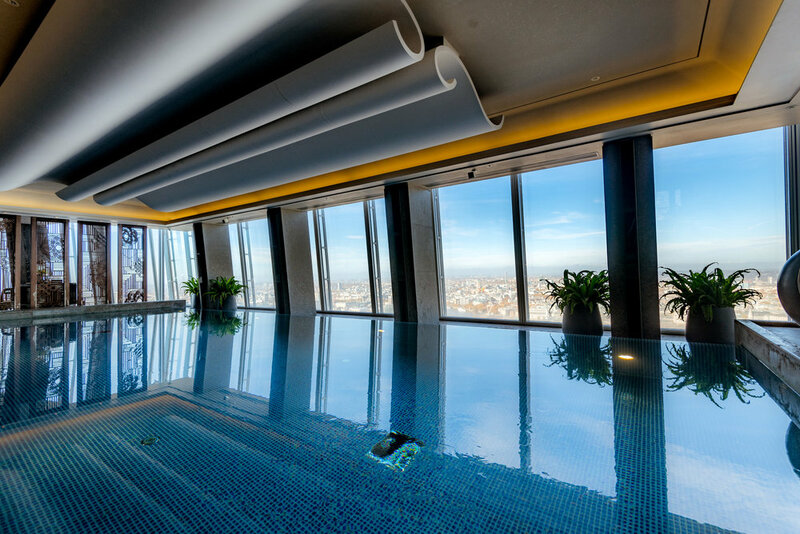 Those who would rather relax poolside with a panoramic view of London can retreat to the hotel’s signature Skypool, which also offers spa treatments to help relax and rejuvenate. The hotel has an impressive list of alternating “experience” packages and offerings that help visitors explore the art and culture of London. For our big day out we chose the “Modern Couples Experience” which centred around an exhibit featured in the Barbican, one of London’s iconic performing arts centres. Before going to the exhibit, we started our day just around the corner from the hotel at Borough Market. Here, we lingered and food shopped until our hearts were content. 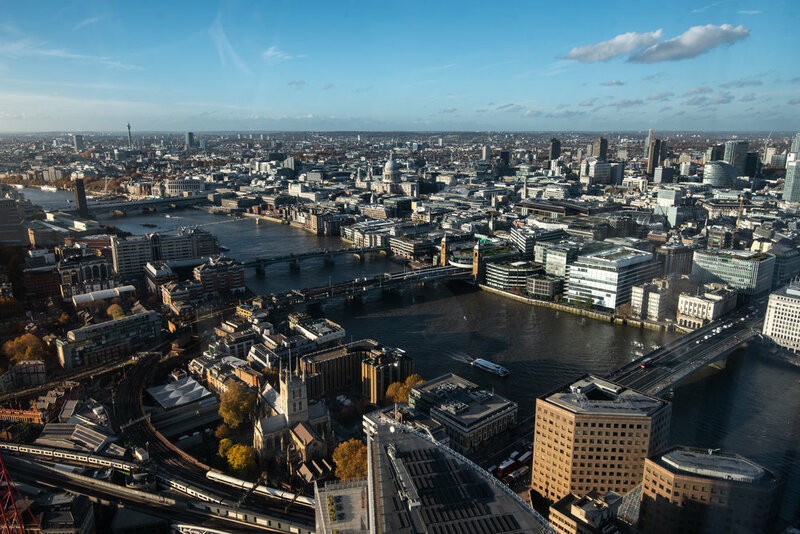 Then, we followed the route towards the Barbican and took in some of London’s signature sites: Millenium Bridge, St Paul’s Cathedral and so much more. Afterwards, we visited the exhibit, which was a fascinating exploration of how relationships become “playgrounds for creativity”. 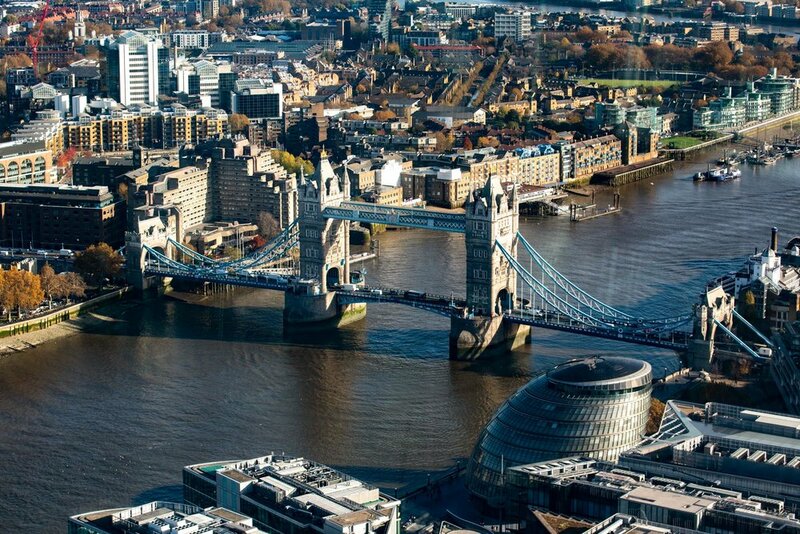 Altogether, the experience package made for a lovely day out in London. Though the Modern Couples exhibit is on for a limited time, a quick visit to the hotel’s concierge can help you sort out a similar route. In short, we’re not sure how Shangri-La Hotels have built a global hotel chain that consistently captures the unique personality and style of each gorgeous destination, but we know that they’ve achieved it again here in London. We were blown away by this hotels commitment to luxury, passion for the small details, and overall elegant ambiance. Whether you’re travelling for business, looking for a simple getaway, or aiming for an indulgent, romantic weekend, this hotel definitely has your needs covered! The only drawback you’ll find is the feeling your stay was too short. Ours was, and we can’t wait to go back again.